I boarded the small Jet-like aircraft at Delhi, the next stop was Kathmandu, the Capital of Nepal. A small country Sandwiched between India and China. The gateway to Mount Everest and a destination I knew almost nothing about. Yet I chose this to be my home for the next six weeks. Volunteering in Nepal was my first Solo Adventure. It was clear almost immediately as I got to the gate that this was not ‘tourist season’. Taller than most. – although, I wouldn’t say 5’5″ was tall – blonder, well just being blonde, paler than pale and carrying a rucksack. Yep, I stuck out. People would stare, which didn’t bother me too much. The women would come up and chat to me and touch my hair and giggle. – I had no idea what they were saying and ended up nervously giggling with them – I seemed to be the only stranger on this ‘Jet’. Everyone, and I mean, everyone seemed to know each other. It was a game of musical chairs right up until we were about to take off. – Reminded me of the mad hatters tea party. Sitting at the end of the Runway, waiting to take off. Suddenly, every single person (except me) on the plane began chanting and praying. Then someone rang a small bell and off we went. – it was if the pilot was waiting permission from those aboard to take off. Oh God, was I missing something here? After collecting my bag, fibbing to passport control. Volunteering is often met by a lot of ‘questions’, so you no, I told them I was hiking. In Monsoon Season, obviously. Dodging the relentless flow of ‘taxi drivers’ and ‘porters’ I found my pre-arranged transfer. My driver hired the help of a (very) young (and thin) boy to take my rucksack off me, I tried to resist, but I’m pretty sure he would have tore it off my back, so I shyly gave in. Sitting in the back of the ‘car’ I suddenly realised, I forgot my raincoat. Surviving the chaotic drive through Kathmandu city I sat on the edge of the bottom bunk of the ‘hostel’. Wrestling my mosquito net into place I wondered what the hell I was going to do for the rest of the day. I was told to rest. This hostel room will be all mine for the next two nights before I head to my ‘home’ for six weeks. I couldn’t rest, my brain was buzzing – maybe too much caffeine at the airport – and I was far too curious about where I was to realise just how tired I actually was. I was in Nepal. I was the furthest from ‘home’ I had ever been. I wanted to explore – and find out when the next few volunteers would arrive. So to kill some time, I decided to be brave. – because you know, I was a little nervous being all alone for the first time – and take a walk around, adventure a little. I got to the end of the street before turning back. The realisation that I had know idea where I was. No phone incase I got lost, I actually didn’t even no how to pronounce the name of my hostel, combined with the overwhelming attention I received, I decided adventuring might need to wait a day. 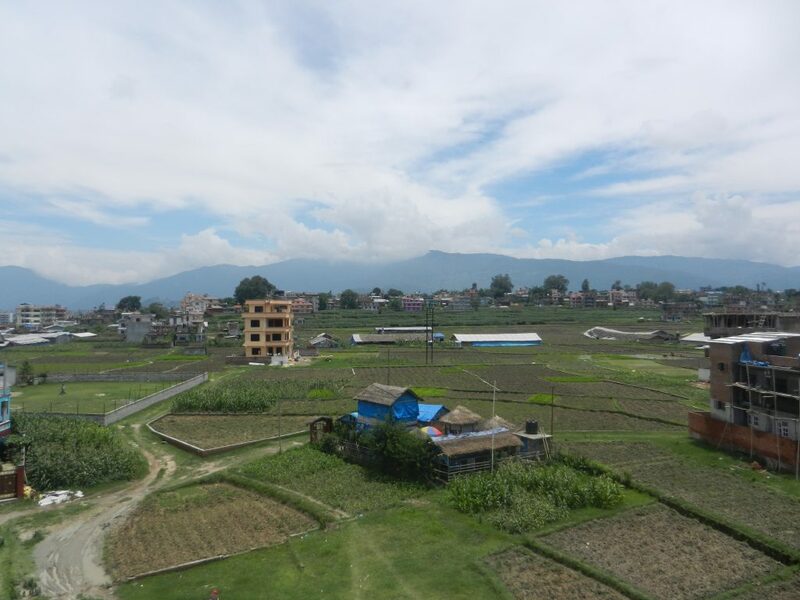 An hour away from Kathmandu City was my home for the next six weeks. The house was built-in a rural area and I was told I was the ‘lucky’ one as I would be living in a big house. The family was quite well off and it had a flushing toilet and occasional internet. I didn’t feel lucky, I felt robbed. I wasn’t expecting to be placed in a modern household. The other Volunteers were living in traditional house holds – don’t get me wrong, the flush toilet was a small relief – I was naive enough to think that the only way I would get an ‘authentic’ experience would be staying with a traditional family. It didn’t cross my (inexperienced) mind that you can achieve this in modern accommodation, the people provide the experience, not the material possessions. Finding my route through the Paddy Fields, I arrived at the orphanage with what looked like mud for shoes. The kids couldn’t contain their laughter as they led me up the stairs to the rooftop to wash my feet. – which all seemed a bit pointless as I just walked through the orphanage leaving mud trails. – Introducing me to everyone we passed on the way to roof and attempting to give me a tour of the house at the same time. The kids were electric. They immediately brightened up my day. My main ‘duties’ at the orphanage were to help serve breakfast in the morning and get the kids ready for school. This was from about 7am – 830am. Then on School days, I wouldn’t be needed again until about 3pm when I would go back and help the kids with their homework. – except maths, they knew more than me, Pythagoras is not my strong point – help with dinner and then we would watch a movie, draw, make up games and I would be taught numerous football tricks – which I was hopeless at – and dance moves which would leave us in stitches of laughter on the floor before I was ‘escorted’ home. – Although the family I stayed with were rich in comparison, many of the other families were not and theft, muggings and armed robbery did happen unfortunately (not that I experienced any) and I was never walking home alone. Heading to the orphanage was the highlight of my day in Nepal when I wasn’t away exploring. At times I would have a fleeting moment of feeling completely useless. – often when the math homework was brought out and someone needed help – but then I would be an audience for a dance routine, a hug when they were feeling sad, a comedian when we decided to go running through the rain and the mud in skirts and sandals. I didn’t get tired of playing the same game everyday and if the kids pleaded enough, I would walk to the next village, visiting several shops to buy everyone a chocolate bar. What did I do with my days while the kids were at school and my ‘days off’? I explored the country with a little help from an Italian. Meeting Francesca turned my experience of Nepal on its head. 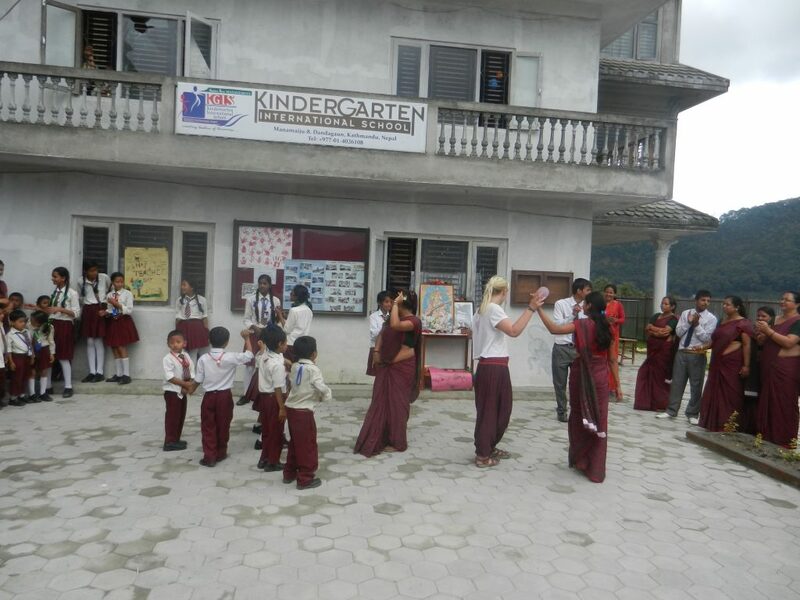 Francesca and her family work very closely with the Orphanage in Nepal. Which is why she was here. We were both passionate about travel and for the both of us, this was our first long haul Solo trip half way around the world. It was comforting to have someone else to talk to and adventure with during the day. Francesca’s time came to an end three weeks into my six and she left. I think I was just as upset as the kids were, so we retreated back indoors to watch Spiderman (for the hundredth time) to try to raise our spirits. Meeting Francesca and travelling with her built up my confidence. When we travelled alone and got lost, there was no major disaster. People were always helpful, I had the greatest tool living with a local family who I could call and pass the phone to a local – which happened a lot – to translate help to get me home when I needed. I woke up to a text from our Guide asking if I would be free to come to visit his friends School today. I wasn’t feeling great, an unexpected bout of homesickness was beginning to kick in (and I just wanted to wallow). I think my guide knew this. Soon I was sitting on the back of a motorbike speeding my way down bumpy country roads – without a helmet, trying not to scream and holding on for dear life – before arriving at the school looking slightly shocked that I was still alive. The crushing homesickness I experienced this morning, was now gone. I loved travelling to other areas of Nepal. It was an honour to be asked to visit another school to ‘experience’ the senior children graduate and to help out in art class. – my favourite class. It was weird being referred to as an ‘honoured’ guest. Especially as I was sitting next to a woman who had to have both her arms amputated. Became a motivational speaker and a successful woman. – in a country where the disabled and injured were often laying on the streets begging. – I mean, she could even write with her feet, her writing was better than my handwriting. What was I offering them? As I (unwillingly) took the microphone from the headmaster. I had no idea what to say and so, like usual, I just babbled. Half way into my babbling I realised no one had any idea what I was talking about. Language barrier, Scottish accent, babbling and speedy chatting does not mix for a successful ‘chat’. With a round of applause I passed the microphone back. Then the afternoons celebrations began. Endless dancing, pictures, food, dancing, swapping emails, dancing, being given more food, dancing. I was exhausted with high spirits. Time to hop on that motorbike – with no helmet, holding on for dear life – and head home. Time at the orphanage was drawing to a close. It sounds as though I didn’t do much, I think that sometimes, but I wasn’t there to change someone’s life. I knew that when applying to go. My being there was there to experience someone else’s world and try to appreciate the one I left back home. 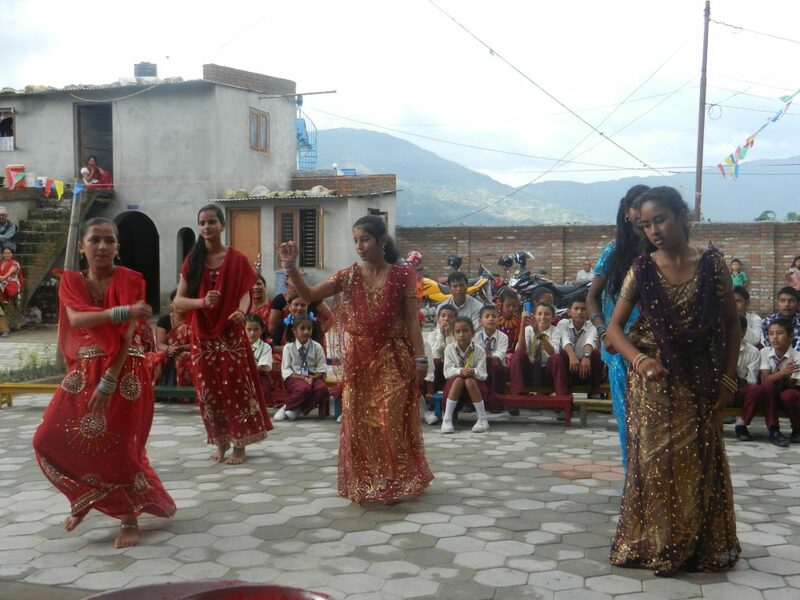 Volunteering in Nepal was meaningful to me. It let me become part of a ‘family’ rather than stay on the outside as a ‘tourist’. I saw into the everyday lives of those less fortunate than me, lived with a family who were fortunate than most. Cheered someone up when they were sad. Helped them improve drawings of Elephants. Taught the kids Scottish slang words and helped as best I could with homework. Learnt how to braid hair and learnt how imagination can create games which will last for hours. My free time was spent seeing as much of this wonderful country as I could. I have a million stories, good and bad. I could share more but I prefer to remember and smile quietly to myself. I experienced areas of the country tourists wouldn’t find. I learnt what it was like to be lost and the complete helplessness it brings. I found how the kindness of strangers reinstated my confidence to try again. I experienced crippling homesickness and loneliness on some days. I was always cheered up by getting lost in imagination with the kids. 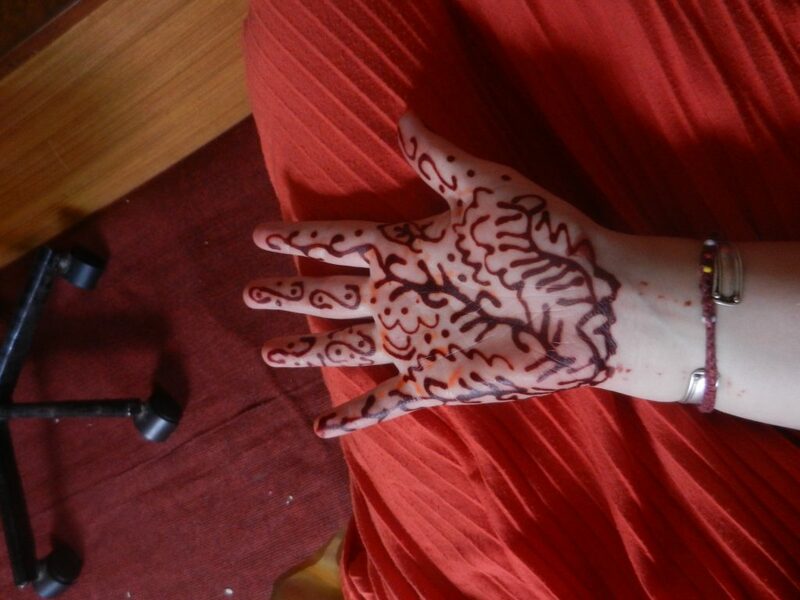 Or being beckoned by the ‘housekeeper’ and being covered in henna. Also being given limitless cups of ‘Chiya’ helped. Volunteering in Nepal, I believe does good. I do believe in some cases it can change someone’s life and steer them onto a path of ‘better’. But more than that, you have just been welcomed (by the most part) with open arms into their home – on the other side of the world – to experience their lives. And you’re a stranger. How amazing is that? I would encourage anyone and everyone to volunteer. Yes, there are scams out there so do your research. Check out the company you are travelling with, the orphanage. I was lucky, everything was ‘legit’. I never once thought or felt like I was there to generate them money, or that the kids were sent there on purpose. Saying goodbye to the children and the staff at the orphanage was heartbreaking. Everyone was crying. – including me – and the children were begging me to stay, come back, don’t leave. I felt guilty for only being temporary. Saying goodbye to my family who I stayed with for six weeks wasn’t as bad. No one cried. – I don’t think I could handle much more tears – Instead I was told; “if nowhere else in the world works out for you. We would be happy to have you back, find you a husband, job and a nice house”. 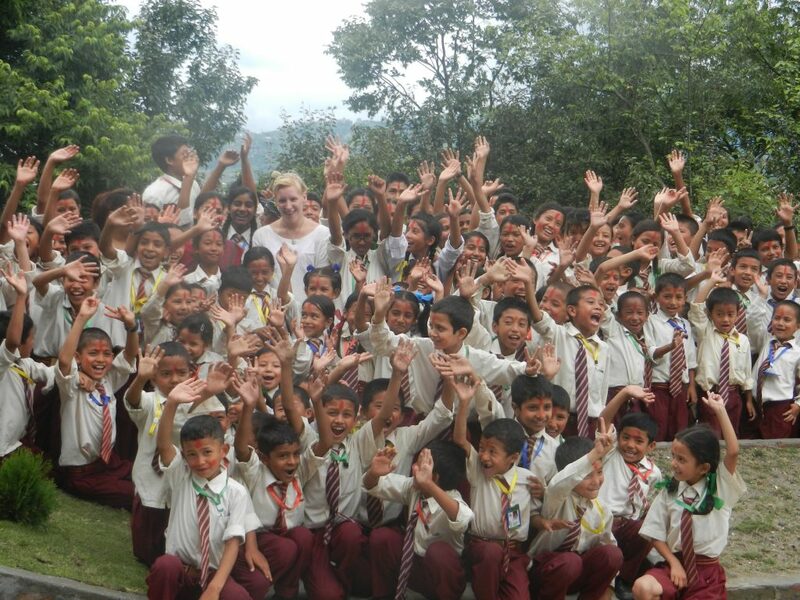 Volunteering in Nepal opened my eyes to some incredible things and inspired me to keep travelling! I will be back.